ANASTASIUS, FELIX, and DIGNA, three more of the Martyrs of Córdoba. SS. 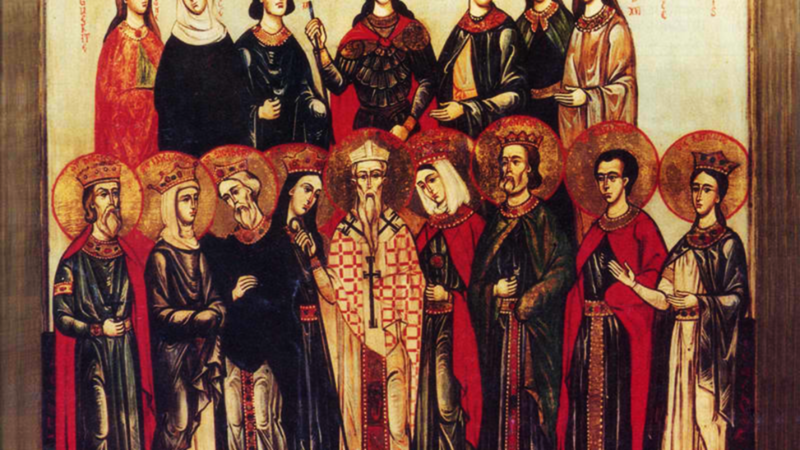 Anastasius and Felix were monks, and St. Digna a nun, at the double monastery at Tábanos. They were beheaded 853. CEARAN (CIARAN), St. Cearan was Abbot of Belach-Cluin in Co. Meath Ireland. He was given the surname “The Devout” because of the holiness of his life. St. Cearan reposed 870. DOGMAEL, St. Dogmael was a monk who evangelised in Pembrokeshire and Anglesey (Ynys Môn) in Wales and later in Brittany. He lived at the end of the fifth, and beginning of the sixth century, no further information on his life is extant. ETHERIUS (AETHERIUS), a Bishop of Vienne, who flourished in the early seventh century Nothing further is known of him. GEROLD, one of Charlemagne’s courtiers, who left the world and became a monk at Abbey of St. Wandrille in Fontenelle, Normandy. Consecrated Bishop of Evreux 787, towards the end of his life St. Gerold resigned his See and returned to Fontenelle to finish his days as a simple monk. He reposed 806. HARTWIG, consecrated twelfth Archbishop of Salzburg 991. St. Hartwig served his See until his repose 1023. LOTHARIUS, the founder of a monastery in the forest of Argentan near the River Orne in Normandy. After St. Lotharius’ repose, the monastery was re-named Saint-Loyer-des-Champs, in his honour. Later, he served over three decades as Bishop of Séez in the Tarentaise valley of south-eastern present-day France. St. Lotharius reposed circa 756. MARCIAN of SYRACUSE, (Date Uncertain), according to Sicilian tradition the Apostle Peter (29th June) sent St. Marcian to Sicily to serve as the first Bishop of Syracuse. However, as the most reliable authorities have been unable to place the date of his repose earlier than circa 254, it is much more likely that St. Marcian was a third century bishop sent by the Pope of Rome of the day, who is regarded in the Roman Catholic Church as the successor of the Apostle Peter. MARK of LUCERA, a fourth century bishop in southern present-day Italy. St. Mark is believed to have reposed circa 328, and was the object of a localised cultus. NENNUS (NENUS, NEHEMIAS), a seventh century abbot of monasteries on the Isles of Arran and Bute in Ireland. PSALMODIUS, an Irish or Scottish disciple of Brendan the Voyager (16th May). St. Psalmodius went to Gaul where he lived as a hermit near Limoges until his repose in the late seventh century. QUINTIAN (QUINCTIAN), (Date Unknown), according to the Roman Martyrology St. Quintian was a Bishop of Rodez in the south of present-day France. However, the current opinion of contemporary authorities is this an error, as St. Quinctian of Rodez became a Bishop of Auvergne, and is venerated on 13th November. Today’s St. Quintian was most likely a simple priest. RICHARD of ST. VANNES, an Abbot of St. Vannes Abbey in Verdun. St. Richard was nicknamed 'Gratia Dei' ('Thanks be to God'), which was a phrase he frequently said. He reposed 1046. VALERIUS and RUFINUS, possibly missionaries from Rome, St. Valerius and Rufinus were arrested in Soissons circa 287, during the Diocletianic Persecution. In court, they both very publicly proclaimed their faith in Christ resulting in their torture and then martyrdom.